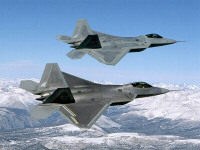 The F-22 Raptor is the world's first stealth air-to-air fighter. It was developed to replace the F-15 Eagle in the air superiority role under the Advanced Tactical Fighter (ATF) program of the US Air Force, the YF-22 by the Lockheed/Boeing/General Dynamics team being selected over the competing YF-23 by Northrop/McDonnell Douglas. The F-22 Raptor is the first production aircraft with the ability to super cruise - sustain supersonic speeds without the use of afterburners. Incorporating stealth, supercruise, and active electronically scanned array (AESA) radar, the F-22 is regarded as the world's first fifth generation fighter. The 43rd Fighter Squadron became the first F-22 squadron when it received its first F-22 (then designated F/A-22) in the end of September in 2003. The 43rd Fighter Squadron of the 325th Fighter Wing at Tyndall Air Force Base, Florida, carried out the F-22 training. In January 2004, the first pilot qualified at Tyndall AFB. The 27th Fighter Squadron of the 1st Fighter Wing at Langley AFB became the first operational F-22 squadron when it received its first Raptor in January 2005. The squadron was declared operational (initial operational capability) in December 2005 with 12 F-22A Raptors. 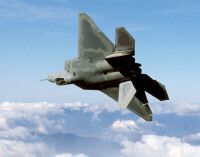 The designation for the F-22 Raptor had previously been changed to F/A-22 to indicate the dual-role air-to-ground attack capability of the fighters using Joint Direct Attack Munitions (JDAM) GPS-guided bombs carried in the internal weapon bay, while optional external pylons offered more flexible stations for air-to-ground armament. In December 2005, the U.S. Air Force changed the designation back to F-22. In March 2006, the 94th Fighter Squadron based at Langley AFB received its first two F-22A Raptors. On January 19, 2007, the last of 40 F-22s for the 1st Fighter Wing was delivered to the 94th FS, equipping both fighter squadrons with 20 Raptors each. The F-22A achieved Full Operational Capability (FOC) in December 2007 with the the integrated active duty 1st Fighter Wing and Virginia Air National Guard 192d Fighter Wing. Also in 2007, the first of 36 F-22s entered service with the PACAF at Elmendorf AFB, which then became the second F-22 combat operational base. In July 2009 it was decided to end F-22 production, with the F-22 requirement for the USAF set to 187 production aircraft. In December 2011, the final F-22 was completed out and production ended at 195 aircraft, 8 test and 187 operational aircraft produced. The final production F-22A was delivered to the USAF on 2 May 2012.